The second edition of the FCBCamps held in Iceland reached an end after the participation of more than 600 boys and girls over the two weeks of group training. These sports workshops observing the FCBEscola methodology were divided this year into a first week for boys and second that was only for girls on the pitches belonging to FC Valur, a century-old club based in the Icelandic capital of Reykjavik. The closing ceremony was hosted by Maria Teixidor, vice-secretary of the Board of Directors and president of the Edelmira Calvetó Group that works on increasing the role of women at the club. Teixidor spoke first at the hugely-attended event that opened with the traditional presentation of diplomas to all of the participants. The speeches continued with former FC Barcelona player Eidur Gudjohnsen and the Icelandic Minister for Education, Science and Culture, Kristjan Thor Juliusson. 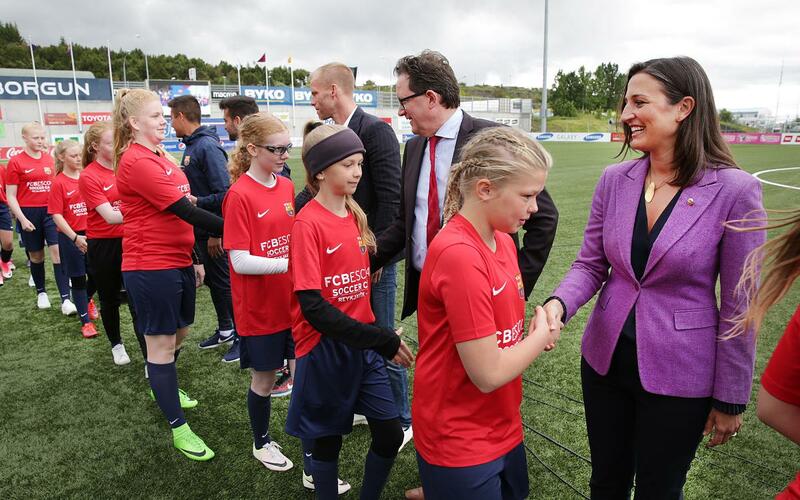 Teixidor explained that it was “an honour to close the second edition of the FCBCamp Reykjavik, the first in our history to be exclusively for girls”, and with which FC Barcelona is continuing to promote the development of women’s sport. The city of Barcelona will be hosting its own girls’ camp for the first time in August. The director also had some words of thanks for “all the institutions that made it possible to hold this camp and also to Eidur Gudjohnsen, who everyone at Barça remembers fondly, and we know that it is thanks to him that Barça has so many fans in Iceland. And thanks to this camp, the support for Barça is growing even more in this country”. Local singer Frikki Dór concluded a closing ceremony that was also attended by the president of the Icelandic Football Federation, Gudni Bergsson; the directors of Football Club Valur; and different diplomats for Spain to Iceland. The Iceland FCBCamp received a record participation this year of 604 players (357 boys and 257 girls) who were divided into three daily shifts on one natural and another artificial grass pitch. A number of players from the Icelandic national team also made a point of visiting, including midfielder Fandís Friðriksdóttir and goalkeeper Hannes Halldórsson. Coaches attending included Kjartan and Arnor Gudjohnsen, the brothers of the former Barcelona star. The FCBEscola is the model of FC Barcelona’s football school aimed at children, the main objective of which is the integral training of its students. This model, exported internationally, seeks to extend the Barça brand and transmit the club’s philosophy of hard work and values to the rest of the world. The FCBEscola works with its own unique model, based on the Barça methodology from the youth teams right up until the first team, with a creative and attacking style of play, and an indispensable transmission of values: respect, humility, effort, ambition and teamwork, with proven success. FC Barcelona currently has a total of 27 active FCBEscolas, more than 170 campuses and 50 clinics, with a presence in over 40 countries across five continents with more than 40,000 children taking part in the different activities that it promotes. The United States will become the country with the biggest presence of the project from September, with the opening of schools in Austin, Chicago, San Diego and Virginia. Inaugurations are also being planned for schools in Haikou and Chengdu, China, Bogotá, Colombia and also in Sydney and Brisbane, Australia.